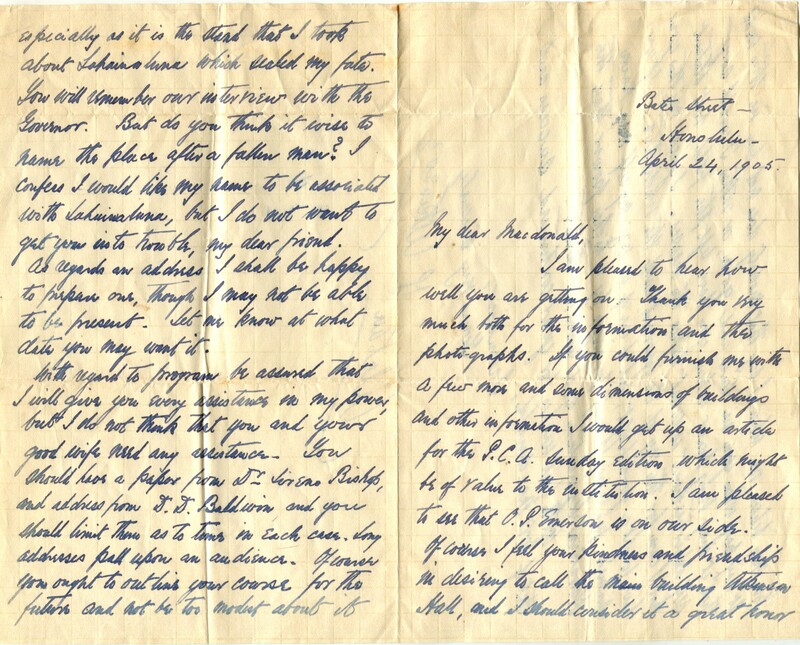 Letters from Alatau Atkinson, Thomas and Lucy’s son, are almost unknown, so I was delighted recently when Leslie Hiraga, one of the Lahainaluna Historical Preservation Committee (LHPC) members at Lahainaluna High School on Maui, in the USA, State of Hawai`i, sent me copies of a previously unknown set of letters dating back to the beginning of the twentieth century. They provide a treasure trove of information. Readers of this blog will remember that Alatau, who was born in a remote part of what is now eastern Kazakhstan, migrated to Hawaii in 1869, together with his wife Annie and first child Zoe. There he started work as a teacher, before eventually rising to inspector general of public schools for the Kingdom of Hawai’i and then the Republic of Hawai`i, and served in the Territorial House of Representatives in 1898, as well as editing the Hawaiian Gazette for many years. (A detailed biography of Alatau, written by his relative Marianne Simpson, can be found here. One of several educational innovations introduced by Alatau was his leadership in revitalizing Lahainaluna School on Maui. The school was originally established in September 1831 as a “high” school, making it the oldest educational establishment surviving today west of the Mississippi River on the continental US. For many years it was the leading educational light in Hawai`i. Indeed, the first newspaper ever published in the Pacific Region was issued from its printing press. Later a bookbindery was added where text-books in Hawaiian and English were published as well as commercial printing. But by the beginning of the twentieth century Lahainaluna was struggling with funding and a decline in enrollment. After Hawai`i became a territory of the USA (1900) federal funds became available to establish a land grant college. Atkinson lobbied strongly to convert Lahainaluna, which was an English-speaking, work-study boarding school for boys, into the college. Alas, the 1901 Territorial Legislature awarded the location to Honolulu on the island of O`ahu, opening the College of Agriculture and Mechanic Arts in 1907 (present day University of Hawaii at Manoa). With the location of the college already decided, Atkinson revised his vision for Lahainaluna. He then lured C.A. MacDonald away from Kamehameha School for boys on Oah`u to take the helm as principal and with funds obtained from the Territorial government in 1903 Atkinson orchestrated a complete reorganization of Lahainaluna. New buildings were constructed and new teachers employed with the aim of developing a vocational trade school. New dorms were constructed, continuing the enrollment of male boarders. The new main building was named in Atkinson’s honor. A principal’s home was constructed, becoming a social hub hosting dignitaries visiting the area. Lahainaluna became known as The Vocational Trade School until 1923. At that time it was incorporated into the public school system of the Territorial Department of Public Instruction as a Technical High School, adding both male and female day students to the previously exclusive boarding school. In 1961, not long after statehood Lahainaluna became a comprehensive high school eventually adding female boarders in 1980, and continues today as such. The correspondence held in the school archives consists of seven letters from Alatau Atkinson to the school’s principal, C. A. MacDonald. There is also a letter from Alatau’s wife, Annie, sent following her husband’s death. The opening ceremony invitation for the new buildings on 7th June 1905 – which Alatau and his wife attended and at which he gave an address – and several photographs complete this important little collection. Alatau’s reference to being a ‘broken man’ refers to his bruising encounter with the new appointed Territorial Governor of Hawai`i, George Carter, who had recently engineered his dismissal as Inspector-General of Public Instruction. Sadly, the hall was destroyed in a fire in 1959.